Information about tickets will be released on a later date closer to the event. Calling all Film-makers age 29 and below! 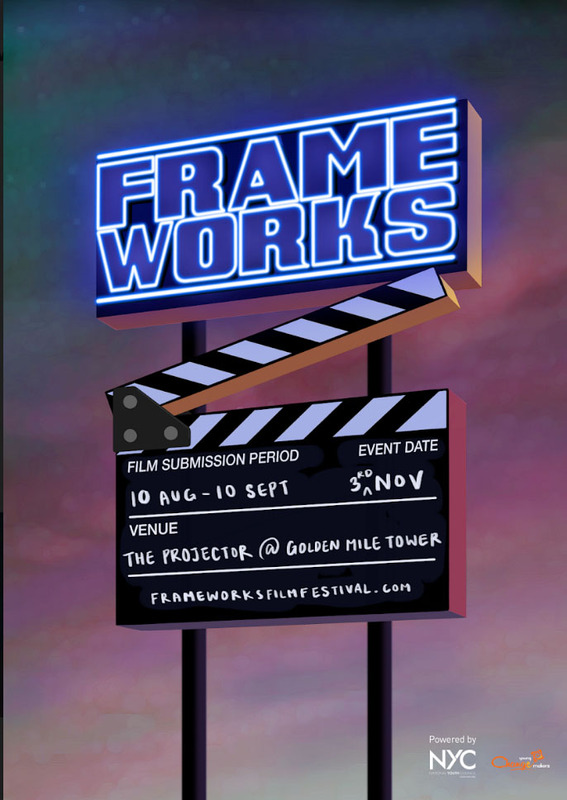 Frameworks provides new opportunities for developing filmmakers wishing to practise and showcase their craft. The intention is to provide an independent, public platform for developing filmmakers to showcase their work and talent, free of heavy cost or experience. Be it first time filmmakers or renowned professionals, every artist will get a chance to be in the spotlight. Through Frameworks, we hope to create a sustainable annual film programme that will make its screening home at the Projector. Submissions will open from 10th August to 10th September! Q: Can I submit more than one short film? A: You may submit as many films as you want! That being said, you are still required to submit the necessary requirements for each individual submission. Q: Is there a time limit to the films I submit? A: The duration of each film should be no more than 20 minutes. As much as we'd like you to express your creativity with as much time as you want, the time slot that we booked at the Projector can only screen so many films, and we want to give as many people as we can the chance to screen their films. Q: May I submit multiple versions of one film? A: Unfortunately, in order to make the selection process more efficient, we request that you narrow down your options to the single, best version for your final submission. Should you submit multiple, we can only assess one option that we will select by random. Q: May I submit a "rough cut" of my film? A: As much as we'd like to entertain "rough cuts" so as to provide communal feedback for future development of your project, we wish to limit the festival runtime to completed works. Q: How old can my short film be and still qualify for submission? A: All films submitted for the 2018 festival MUST have been completed in either 2017 or 2018. If your film was completed before 1st January 2017, it is no longer eligible for submission. However, if your film's production took place prior to said date, and was completed in 2017/2018, it is still eligible for submission. Q: What happens if my film can't play? A: We have narrowed down the permitted video formats to .mp4, .mov, and .m4v so as to limit the possibility of your film not being able to play. In the unlikely event that we are unable to play the clip in the permitted format, we will notify you as soon as possible to send us another copy. However, should you choose to mail your submission, we cannot guarantee that your replacement copy will arrive before the deadline, so it's a good idea to submit earlier if you're afraid of anything going wrong. Q: If my film includes non-English dialogue, is it required that I include English subtitles? A: In order to cater to a wider audience, all projects that contain significant non-English dialogue MUST include on-screen English subtitles at the time of submission. Please do not send us an unsubtitled foreign-language project with the intention of providing a subtitled version at a later date. If your project is mostly in English and you wish to intentionally leave out subtitles for any non-English dialogue as an artistic choice, you do not need to provide subtitles for those particular sections. If you are submitting a physical disc, we prefer that all subtitles are hardcoded to your video file as opposed to including discreet subtitles that need to be turned on in order to be displayed on the screen. Q: Do I have to be a Singapore Citizen or Permanent Resident to be eligible for submission? A: Unfortunately, as this is our first year, we want to cater to a local filmmaking community. As much as we like to support youths over the world, we can only accept Singapore Citizens and Permanent Residents this time round. Q: Do I have to be of a certain age in order to be eligible for submission? A: As much as we'd like filmmakers of all ages to submit their work, we will be putting a limit on age. Only filmmakers aged 29 years and below are eligible for submission. Q: Can I submit an updated cut of my film after submitting an earlier version? A: We do not accept updated versions of projects that were initially submitted. Should you still submit an updated version, we will only assess your previous submission only. We can only guarantee that the first version we received will be viewed, so do not complete the application until you are comfortable with the version you are sending to us. Q: When will I find out whether or not my film was selected? A: We will contact you by the 9th of September as to the success of your submission. Q: Do I have to get rights clearance for trademarked/copyrighted material included in my project? A: From a legal standpoint, you must clear all trademarked and/or copyrighted materials included in your project before you can exhibit it publicly. We will not be held responsible for any inclusion of uncleared trademarked or copyrighted materials in your film. It is the sole responsibility of the entity submitting the project to secure permission from the trademark or copyright holders of the material in question, be it music, stock footage, or any other elements that could violate an existing trademark or copyright. Quite often, rights holders offer reduced rates for independently-produced projects, so you should contact them directly to avoid any potential rights infringements. We look forward to receiving your masterpieces! Film away!